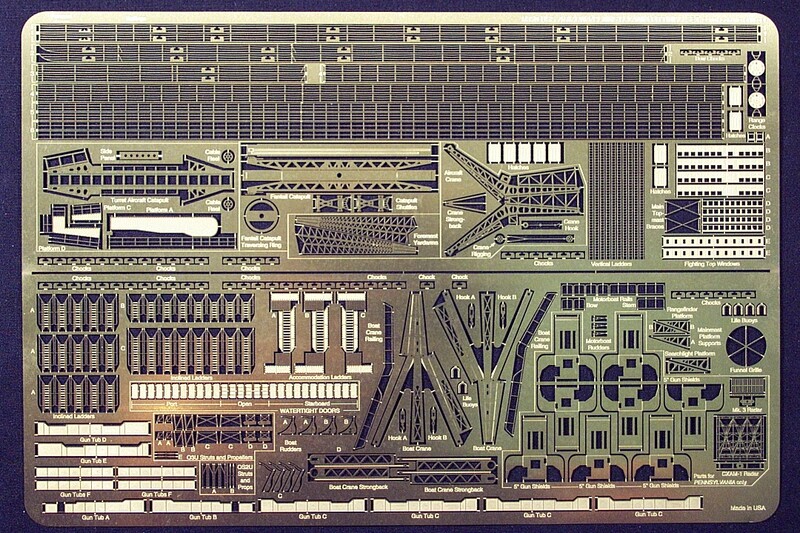 Equips Banner's new 1/350 scale plastic kit of the battleship USS ARIZONA. Includes precision-etched "drooped chain" rails pre-sized for the main deck, several styles of railing for all upper decks, catapults, cranes, boat and aircraft details, watertight doors, hatches, 3-D relief-etched window frames for fighting tops, vertical and inclined ladders, accommodation ladders with simulated canvas covering on the rails, range clocks with raised numbers and pointers, and 3-D relief-etched splinter shields for the open 5" gun mounts. Allows the modeler to build the kit as a 1930's version or as the ship appeared at Pearl Harbor in 1941. Also includes fold-to-shape gunshields and detailed radars for converting this kit to sistership Pennsylvania as she appeared in late 1941 through early 1942. 3-D relief etched in brass for extra detail. Can be used with all 1/350 scale 1930's - 1941 USS ARIZONA model ship kits.